Anatomical variations of the lateral offset of the acromion (LOA) are supposed to be a factor favoring of the development of rotator cuff tears. The primary objective of this study is to quantify the inter-individual variations of the lateral offset of the acromion. The morphology of 103 dried scapula was studied. Scapula with an os-acromiale, fractures and osteoarthritic changes of the glenoid cavity were excluded. We measured the distance between the medial edge of the spine and the supra-glenoidal tubercle of the glenoid fossa (L0), as well as the distance between this medial point and the most lateral point of the acromion (Lmax). Then, the acromial offset = (Lmax − L0), in absolute value (mm) and in relative value (% of Lmax) were calculated. The absolute average offset is 3.2 cm (SD = 0.4040 cm), the relative average offset is 23.07% (SD = 2.195%). We observed a non-Gaussian distribution of the LOA, with two peaks of distribution of which average and the median offset measurements are situated between these two distributions. 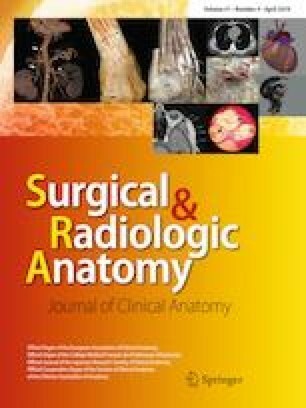 This study shows that there are two different morphologies for the scapula, characterized by the lateral offset of their acromion: small or large lateral offset. Clinical implications in shoulder pathology seem important because the resultant of the constraints applied by the deltoid to the joint would favor either rotator cuff tears, or scapulohumeral arthrosis. Authors want to Acknowledge people who donate their bodies for teaching and research. The authors declare that they have no direct conflict of interest in relation with this research protocol. P. Clavert is a consultant for Wright-Tornier and is associated editor of Orthopaedics and Traumatology: Surgery and Research. There is outside funding for this research protocol. As the study was conducted on cadaveric material, relevant consent had been obtained at the time of body donation in accordance with the Human Anatomy (Scotland) Act 2006.